Feed the people and fund human needs! Let us all do our best to double our efforts for justice and peace in the New Year. Mahalo for your solidarity. Join the Hilo Peace Vigil on Fridays when possible. U.S. War spending tops what all 50 State governments combined spend for health, education, welfare, and safety. According to Wikipedia data, the total budget for defense in fiscal year 2010 is at least $880 billion and could possibly top $1 trillion. That’s more than all the state governments collect. With its 1,000 bases in the U.S. and another 800 bases globally, the U.S. truly has become a Global Empire “Warfare State.” Today, military-related products account for about one-fourth of total U.S. GDP. This includes 10,000 nuclear weapons. Indeed, the U.S. has lavished $5.5 trillion just on nukes over the past 70 years. To live and act nonviolently… never involves standing “idle in the face of threats.” Dorothy Day, Cesar Chavez, Dave Dellinger, Daniel and Philip Berrigan, and countless other genuine peacemakers (including Hawaii’s George Helm) have put their lives on the line in the struggle for a more just world. Advocates of nonviolence, like Gandhi, simply believe that means and ends are inseparable – that responding in kind to an aggressor will only continue the cycle of violence. Peace on Earth, Goodwill to All! If You Want Peace, Work for Justice! Blessings of the Season to You! It is the Christmas/Chanukkah/holiday season and again we come to you with our annual appeal for support of our work for justice, peace, saving the environment, and feeding people in need. We can’t do this alone. Your partnership through financial support, and other solidarity actions, are vital. The U.S. is in its ninth year of war and embarking on a major escalation that will result in more homes and families bombed into oblivion. We reached out to keiki o ka aina, Barack Obama, to say it’s a big mistake to escalate the war. In the last few Hilo Peace Vigil leaflets (this is our 431st consecutive week) we said it was a mistake not only for moral reasons, but for practical reasons. The wars are bankrupting the U.S and stealing funds from unmet human needs. In addition to the U.S. waging war in Iraq, Afghanistan, and Pakistan, it appears increasingly likely there will be an attack on Iran. Talk about a military/economic policy twist of “Go For Broke.” While more people are losing their jobs, homes, health care, and in need of food assistance, the U.S. is spending more on its military than the rest of the entire world combined. 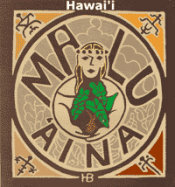 At Malu ‘Aina Peace Farm we live in a very different world from corporate bonuses and lucrative military contracts. We are an all-volunteer shoestring operations. No wages or salaries. We live simply on small scale solar electric power and grow organic food to share freely with an increasing number of people in need. We market some food crops to help with expenses, but as volunteer farmers and peace educators we need to ask for your support to continue. Our efforts to acquire an adjacent eleven acres of prime ag land through a cost share state grant to help feed people and train a new generation of farmers has not been successful. The funding was approved but Governor Lingle refused to release the funds. It’s another example of plenty of money for war and corporate bailouts but little funding for the poor, education, health care, and local food production to reduce importing 85-90% of Hawaii’s food. Scripture teaches us to never lose hope –never give up. Keep the torch burning. Continue to plant seeds to nourish the body and the spirit. Continue the effort to beat swords into plowshares and build a more just society locally and globally. So that is what we try to keep doing in partnership with you. Together, in this holy season, help us find the next generation of torch bearers to carry on Malu ‘Aina’s important work of 30 years. Please join us in the work for justice and peace. Let us pray for the courage to speak and act to keep hope alive, especially for the least among us, for those bombed, already broke, and near broken. Blessings to you and your ohana in the New Year.